The Biggo Trio Swingset brings innovative fun to your commercial playground. 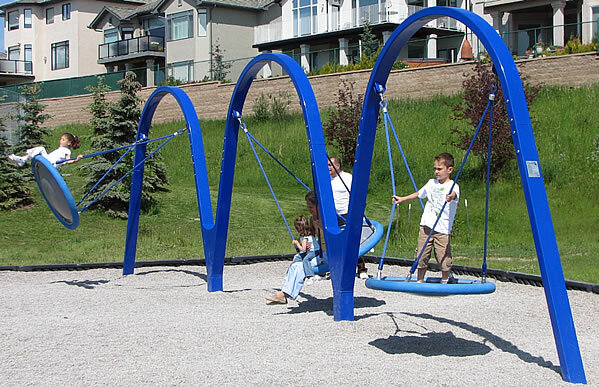 It has a unique, streamlined European design rarely seen on U.S. playgrounds, and this model has 3 bays, with 1 swingseat in each bay. The swing seats can each fit up to 4 children at one time, unlike typical playground swings. The seats are made from light aluminum and have a rubber safety bumper, minimizing the risk for kids standing nearby. The design of the seats promotes inclusion and easy access by kids of all levels of motor skill. Both the frame and the seat are available in a variety of different colors, at no extra charge (see below), and in other colors via special order. The Biggo Trio Swingset is manufactured by Dynamo Playgrounds, one of the most exciting names in playground equipment design. It’s also available in models with 1 swing or 2 swings. Total Weight: 2,100 lbs. / 953 kg. Interested in the Biggo Duo Swing Set Structure?